Top Gear‘s “The Stig” and HarperCollins have won their court battle with the BBC over the right to publish his autobiography and reveal the mystery man’s identity. The BBC had argued that the confidentiality agreements they had with The Stig should prohibit him from writing about his time on Top Gear. The court rejected that argument and HarperCollins will proceed with their plan to publish The Man in the White Suit on September 16th. So (spoiler alert?) the man behind the white helmet has been revealed to be…Ben Collins. 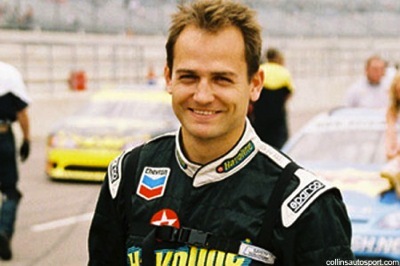 He’s been involved in racing since 1994 and has driven in Formula 3, NASCAR, and at the Le Mans 24 hour. He also was a stunt double for Daniel Craig in the James Bond movie, The Quantum of Solace. The Man in the White Suit by Ben Collins will be released on September 16, 2010 in the UK. There’s no word on when it will be available in the US.